danielle decided to give her most precious possession in hopes that another little girl in new orleans might be comforted. danielle's mother explained the hurricane disaster to her and showed her photos on their computer. "the next day after she started thinking about it, she started saying, 'maybe I can share my clothes with them because some of them don't have clothes because their clothes got washed away.' and so we went through her clothes and filled up three boxes. she would have given more, but I wouldn't allow her to give her school uniforms and shoes away." danielle didn't stop there. she donated toothbrushes and canned food in drives at her school. finally one night, she walked out of her room and said, 'mom, they have food and they have clothes, but they don't have any toys.' her mother told her, 'well, they're not really looking for toys right now. they more need clothes.' but danielle said, 'i want them to have toys.' and she had tears in her eyes. 'I want them to have toys.' her mother's reaction was, 'ok, well, let's just wait a few days and see if she still wants to do this.' 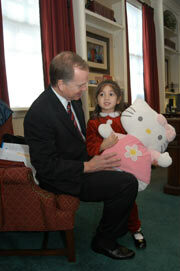 so a couple of days later, she said it again, 'i want to give my hello kitty away.'"